The Establishing Shot: The Heat is the funniest film I have seen this year. Hail the new queen of comedy Melissa McCarthy! The Heat is the funniest film I have seen this year. Hail the new queen of comedy Melissa McCarthy! Paul Feig's The Heat is absolutely hilarious. Both my wife and I were in fits of laughter the whole way through. Getting Sandra Bullock and Melissa McCarthy to team up is a stroke of genius as their personalities are yin & the yang and their chemistry carries the film over the touchline. The Heat is one of those rare films that despite releasing funny trailers and clips still leaves lots of unseen hilarious bits on screen to be experienced. 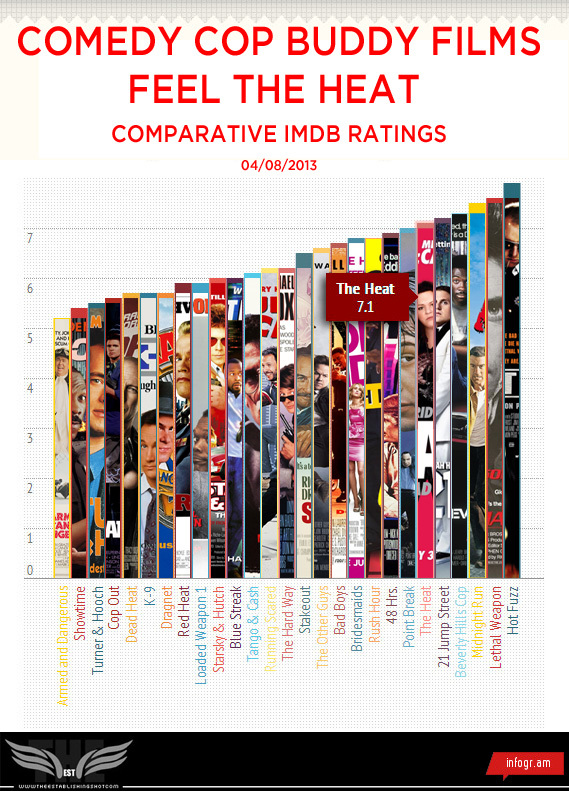 You can read on about how funny I thought The Heat was or you can peruse the infographic below showing the IMDB ratings for the most notable Comedy Buddy Cop films of recent years and you can see where the The Heat fits in. 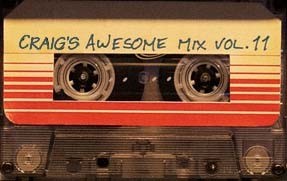 Some suprises: Hot Fuzz is No.1? Surely I am not the only person that thought that Billy Crystal and Gregory Hines's brilliant 80s Running Scared is the greatest Cop Buddy Film ever made? 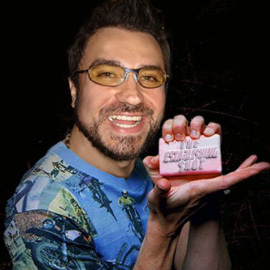 * Sorry if I missed your favourite, yes I know you didn't think Point Break was a comedy and there are a couple of films in there that are not strictly comedic but the contradictory relationship dynamics lean towards humour. I have also included Bridesmaids for comparative purposes. 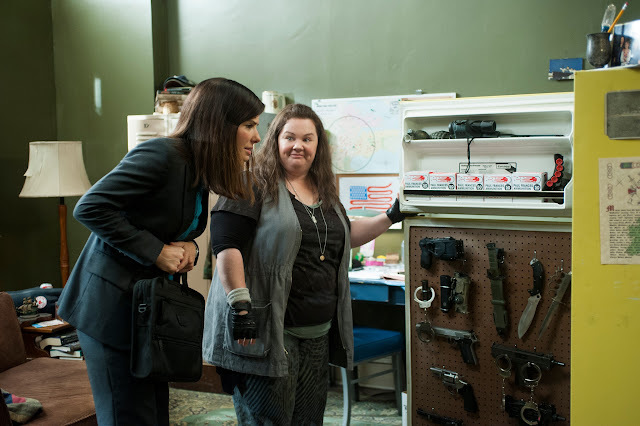 FBI Special Agent Sarah Ashburn (Sandra Bullock) – the Fed – and Boston cop Shannon Mullins (Melissa McCarthy) – the Fuzz – couldn’t be more incompatible. But when they join forces to bring down a ruthless drug lord, they become the last thing anyone expected: buddies. From DGA Award winner and Emmy nominee Paul Feig, the director of Bridesmaids (worldwide theatrical gross: almost £200 million), The Heat takes a look at the odd couple pairing of two law enforcement officials who, to their everlasting shock, slowly find themselves on the same page. 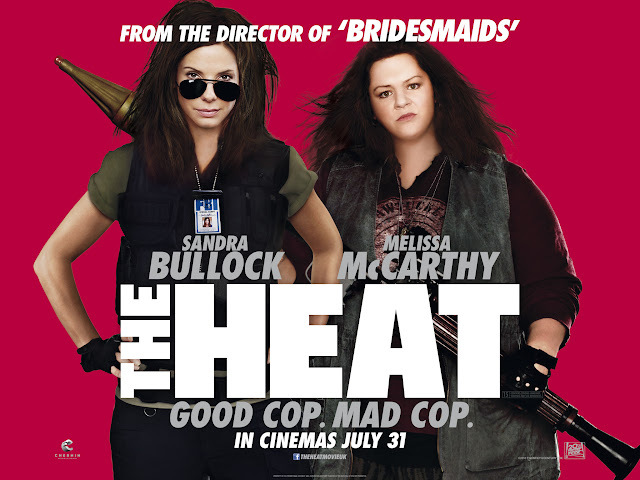 Starring Oscar-winner Sandra Bullock, whose films have grossed $2.9 billion worldwide, and Academy Award nominee Melissa McCarthy, who has had two consecutive smash hit comedies – Bridesmaids and Identity Thief – in as many years, The Heat has bawdy laughs and real emotional stakes. I respect Sandra Bullock's talent - she can deliver decent performances but few of her comedic films are made for me - but there is magic pairing her up with Melissa McCarthy. McCarthy who has not disappointed in any of her recent comedy roles (Bridesmaids, Identity Thief, The Hangover Part III) and is always memorable no matter how much screen time she gets. Pairing Sandra Bullock's uptight, ambitious Ivy League go getter FBI agent with McCarthy's crass police detective is comedy dynamite as they team up and rip up Boston on the trail of a drug lord and no one is safe from from being burn. 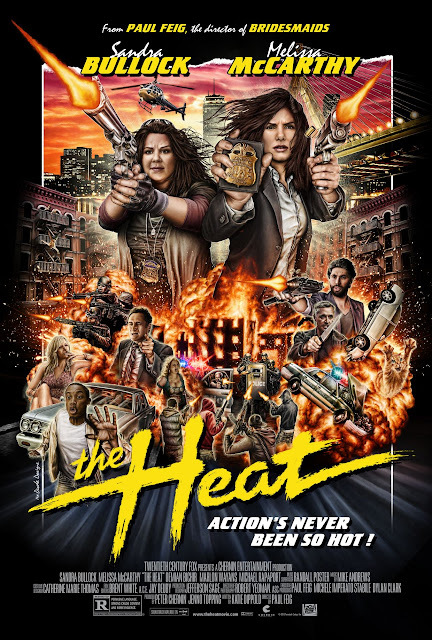 The Heat is light on story and pretty much a by the numbers mismatched cops buddy movie but who cares all of that is just a vehicle to get us to the set ups so that the chemistry between Sandra Bullock and Melissa McCarthy's contrary characters can be ignited. Director Paul Feig and Parks and Recreation Writer Katie Dippold on her first feature film, have a knack for capturing personalities and placing them into situations where their gravity affects everything around them. 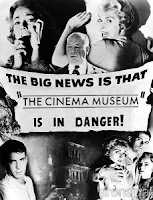 Of course this is helped by the kinetic performances across the board. The Heat is hilarious and certainly Sandra Bullock's funniest film to date.